Welcome to Gaylan's Golden Retrievers' blog. Here you can follow our puppies' development and read about issues that are important to us. Reader Beware! We are serious dog breeders so may discuss the gory details of our breedings. But if you would like to follow the birth and development of our puppies, read on. Of course, during the months we don't have pups, I'll share my thoughts on the state of golden retrievers and purebred dogs in general. The Number Litter is 5 weeks old today and one thing I know for sure is I have fallen down on blogging! So where do I begin? The pups have moved downstairs to their play area and are truly rocking potty training. We started in a small pen, but they are doing so well that they now have a fairly large indoor pay area that will grow in size over the next week. To say they love their food is an understatement. They are eating a raw diet with the 3 supplements we feed all our dogs, ProBalance, Geneflora and Bravo Wild Salmon Oil. As of today they are eating 7.5 pounds of food a day. We are feeding them in lots of different locations. Tonight we had each puppy eating individually while on a grooming table. While they were eating we handled them like they were being stacked, lifting and moving legs, touching them all over. They were wonderful about it! Paige continues to be a good mom. Here is a picture of the pups just after she stopped nursing and headed to the bench she uses to get out. Oh, did I mention they have teeth? The good thing is they don't have a lot of jaw strength yet, but that will change in the next week. We have set up an outdoor area for them and Jim is building a ramp for them to use to access it through a dog door. They have spent some time outside and love investigating things. One of the things we have had outside for them to find is birds. They really love them, as you can see. In the next few days their following instinct is going to kick in, so we will be starting our woods walks. The nice thing about summer litters is we will be able to get them into the pond, too! So stay tuned ... Oh yeah, lots more photos are up on the smugmug page! You can access it in the upper section of the banner on the right. Enjoy! 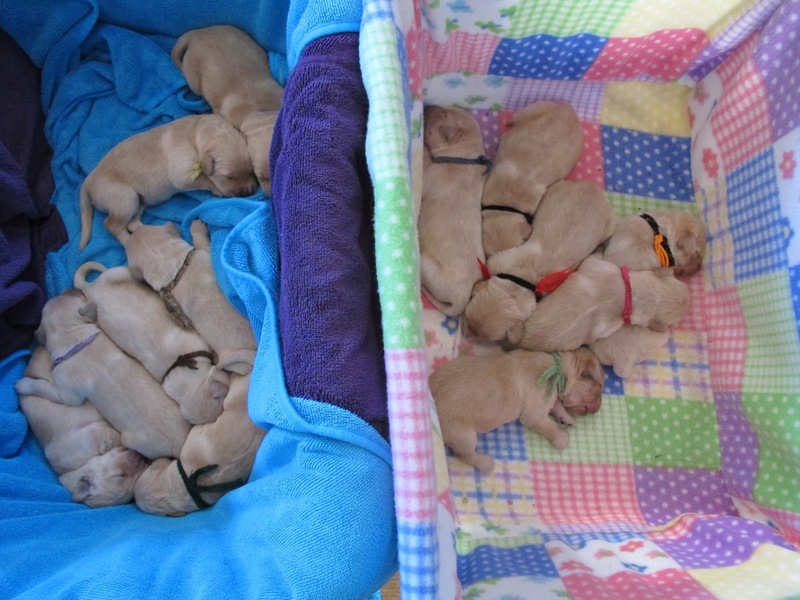 It is really hard to believe that the Number Litter is 3 weeks old today. Not only are their eyes open, but now their ears are open, too. We are supplementing them once a day, since it is hard for Paige to keep up with their demands, which are going to hit an all-time high this week. She continues to be a wonderful mother, although is questioning the need to spend so much time in the box when the other dogs are out chasing bunnies and swimming. Two of the pups are over 3 pounds, and the others are not far behind. Today we did a vacuuming around the box and they were completely unfazed by it. They days of being able to enter a room unnoticed are long gone! They have also found their voices! We have added a potty box to their digs and we have almost 100% with poop,,,pee, not so much. I started earlier than usual because the box was getting quite wet, with Paige's inability to keep up with them. Our friend Joanna stopped by and took in some puppy breath! With 13 pups, we are grateful for anyone who wants to come and help us handle them. We are done with ESI, but still handle them every day, between weighing, bottle feeding, and running a comb through their coats. Paige is sitting up a bit when feeding the pups. Amazing how dams know the pups need to use their bodies, and they teach them simply by sitting rather than lying down. More photos and video are up on the photo site. 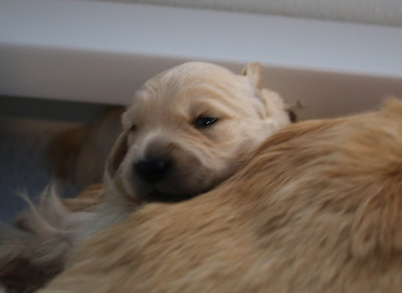 As far as the puppy cam, I hope you are enjoying it! Paige and the pups enjoying their new digs! Wow, where do I begin? This past week has been busy continuing with 24-hour watching of the pups, weighing them 2x a day, doing ENS and ESI, cleaning and disinfecting, nails, caring for Paige and trying to get some "real work" done. One of the pups got a severe upset stomach at 2:30 in the morning on Tuesday, which prompted a trip to the ER. We were fearful it might be something serious since, as those of you who are watching the puppy cam probably noticed, all the pups had diarrhea, but it was not. We decided to stop supplementing the pups and let Paige's nutrition take over and now everyone is doing well. In order to manage weights rather than supplementing, those with smaller weight gains get some private nursing time. The big news is their eyes are open! For me that first reflection of light in their eyes is so wonderful. It is the very first step of the outside world opening to them. In a few days their ears will open, too. Yesterday we moved the pups into their new digs. We don't usually move them into a larger box at this point, but it was getting really crowded, which means Paige cannot get comfortable. They have adapted to the new box very well! I have uploaded lots of new photos and videos into the photo section. Oh, I am not the best photographer, but wanted to let you know that some photos look blurry, but they may be videos. Just look in the lower left-hand corner of the photo and if you see a little video camera icon, click it on to open the video. Lise and I were clipping nails the other day, which we do every 3 days, and figured out that by the time the pups go home we will have clipped 4,680 nails! The great part about doing it is that the pups learn that having someone handling their feet is just something that happens to them. By the time they go home, the new owners should have no trouble doing their nails. 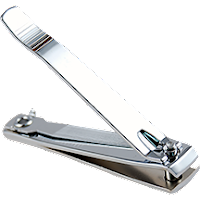 At this age we use a human nail clipper like the one to the right. Eventually we alternate between clipping and using a Dremel, shown below. The puppies have all doubled their birth weights! Because we have 13 pups we are giving private feedings to the pups with the smallest weight gains each morning. Depending on what their overnight gains were, we may give a supplemental feeding to all of the pups at some point during the day. Many people ask why we don't supplement more often, which is a good question. Without question, the best nutrition for the pups is Paige's milk. We provide Paige with the best possible nutrition we can, feeding her what we believe all dogs should be eating for life, a high-quality diet for breeding stock (we happen to feed a raw diet, but there are kibbles out there that meet our requirements) with 3 supplements we believe all dogs should be on for life - a high-quality vitamin/mineral supplement, a canine single-organism probiotic and DHA. The brands we use are ProBalance, Geneflora and Bravo Wild Salmon Oil. Her milk changes as they get older, providing them with the nutrition they need at that stage of their development. Our goal is for Paige to be able to supply all the nutrition for the pups. If we supplement too much she will produce less milk, because her milk production is a demand/supply system. Right now Paige is eating 5 pounds of food a day, and that amount will increase as their demand on her increases. Paige has been wonderful with the pups. For a dog that is used to a lot of work every day, her mothering instinct with the pups has been fabulous. At nine days in she is beginning to get a little bored, and yet is still willing to spend most of the day in the box with them, nuzzling them, cleaning them and keeping them warm. We are truly blessed that, like Paige, our girls are wonderful mothers! Here are some fun photos and a video of the pups. There's lots more on the Smugmug site, so be sure to check them out. "There has to be some mile here somewhere"
The Number Litter is getting big! They get hot too quickly when we put them in the warming box (with the heat off) while we clean the whelping box, so now we have switched to using two boxes. How do we know they are happy? They are quiet!! Paige continues to be an amazing mother - keeping both herself and her pups really clean. She is enjoying the 4 pounds of food a day and her special treat--having Cindy, her mom, visit for an overnight stay! It's day 4 of Early Neurological Stimulation (ENS) and Early Scent Introduction (ESI). The first three scents were fox fur, evergreen and anise. Today's scent was clove oil. Most pups were neutral to it but two or three were really taking in the scent. It's time to trim their nails again... all 234 of them! We've uploaded more photos, so check them out along with the webcam! Gaylan's Number Litter Has Arrived!! When our friend Cindy Groveman offered us the opportunity to breed her wonderful girl Paige (HR Sunfire's Turn The Page To Gaylan NAJ MH WCX ***) we jumped at the chance! Then the search began for Mr. Right. After looking at a lot of stud dogs we decided Mr. Right was Ellen Hardin's wonderful boy Moses, who lives in Wisconsin. Doing the breeding required a lot of driving because Paige was in Florida when she came into season and I was on Long Island. After 3,600 miles of traveling, we got home and waited to find out if Paige was pregnant. On April 1st, when the vet placed the ultrasound probe on her belly her words were, "Oh, she is chock full!" Over the next month Paige got bigger and bigger and we knew we had a nice-sized litter. 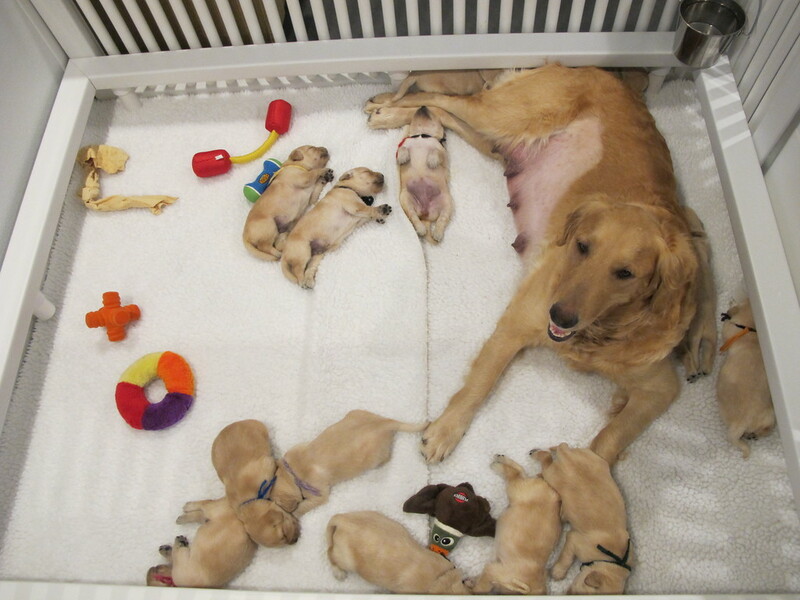 On May 5th at 3:00 the first puppy was born and by the time she was done she delivered 14 puppies. So the Number Litter was an appropriate theme for this crew! At 4:20 the last pup arrived stillborn. We mourn his loss, but celebrate 13 beautiful pups who are going to certainly keep Paige and the rest of us busy over the next 8.5 weeks! Join us on this journey by checking out our webcam, photos and videos, the links to which you can find on the upper right of the sidebar. I often get notes expressing jealousy over the wonderful life I am able to live breeding and raising dogs. Those notes are sent with so much love and joy that I accept them graciously. I know most people think my days are filled with contented dams and cute puppies. Occasionally do I chuckle over those emails after I've just done Poop Patrol, made yet another run to my vet's or answered a late-night emergency call from a worried owner. But yesterday was a day that I think needs sharing because it's an experience every breeder has but few other folks know about. Yesterday, we almost lost Mr Purple. He has been our smallest puppy since birth and hasn't kept up with the other pups' weight gains. And yesterday, four days into his life, he crashed. We had been watching him vigilantly, 24/7, since his birth. And when I say 24/7, I mean every minute of every day someone has been with the litter, monitoring him and ensuring no one got chilled or squished by a sleepy mom. Needless to say, we are all a little tired...especially me :-). Mr Purple had lost weight on Saturday night so the next morning I went to work checking his vitals-- temperature, blood sugar, urine pH and hydration. The puppy room looked like a hospital ward. He had a very low-grade fever and was slightly dehydrated so I gave him glucose solution, one drop at a time. Puppies can't gag so it's easy for them to choke if you go too quickly. He rebounded enough for me to take a nap but when I awoke late yesterday afternoon, Puppy-sitter Extraordinaire Noelle told me she was worried about him. She was right! He was limp and weak so I started emergency measures. I tube-fed him fluids, which entails sliding a narrow feeding tube down his throat into his stomach. Yes, it's a scary thing to do but essential when puppies are too weak to nurse. The other option is taking them to the vet for IV fluids but it was Sunday night so that wasn't easily done. And like most breeders, I worry about taking a newborn puppy to a vet clinic where they may come in contact with bad bugs from sick dogs. Despite my efforts, nothing was working! His temperature climbed to 101.5 F (normal for a one-week old puppy is 96-97 F). He was so dehydrated that I couldn't get blood to test his blood sugar. He was flacid and limp. Bottom line, Mr Purple was dying. I started sub-cutaneous fluids and called my vet for antibiotics. What kept me going this whole time was how annoyed he was with everything I was doing to him. He fought tubing and the sub-Q fluids so hard that he stabbed me with the needle. Yay! I was thrilled he still had enough strength to resist my efforts, even if they were well intentioned. He had no way of knowing that and just knew I was making him uncomfortable. My wonderful vet (shameless plug...Dr Jim Zgoda, Otterkill Animal Hospital, Campbell Hall, NY) called in a prescription for antibiotics, Noelle came back to puppy sit and at 10 PM last night I got home with the drugs. We ended the night with another tube feeding session, this time with formula since he still wasn't nursing enough. Although I didn't sleep last night, apparently Mr Purple did...and he nursed! Today, he is robust and vigorous. He gained weight overnight and is nursing actively. He is still very annoyed with me but I know he'll get over it if I can just keep him alive. My breeder friends are probably reading this post, thinking, "So what? We all do this." I agree but I don't think other dog-lovers have any idea what goes into raising a litter of healthy, stable puppies. Yesterday was just one of many challenging days and thankfully, it ended well with Mr Purple rebounding. So today, I am again lucky to be a dog breeder! P.S. The Puppy Cam went down yesterday morning but I should have a new one here and installed sometime tomorrow.